Press release distribution by SBWire helps your business get noticed by publishing your content on hundreds of media sites. Our press release publisher will walk you through the process of creating great press releases, saving you time. Distribute your first press release today! If a major storm causes damage to several homes, homeowners can expect insurance companies to become inundated with claims. The longer a person waits to file a claim, the longer the wait for an adjuster to visit the property, survey the damage and have the home repaired. It is not unusual for the entire process to take several months. When it comes to the prime spotlight of such a high caliber race, it's great to see the 2019 Ram Heavy Duty Kentucky Derby Edition at the forefront of the race. Gary Barbera went on to say, "I'm excited for the greatest two minutes in sports, and for the support that Ram has given at the biggest horse race of the year in Kentucky. It's great to be a part of the Ram line of vehicles and to see unique models like the 2019 Ram Heavy Duty Kentucky Derby Edition." Cattle feed and feed additives are used for improving the quality of feed to enhance yield and overall cattle's health. Cattle feed are gaining popularities mainly due to the enhance performance and increasing application such as growth promoter, prevention and cure of diseases and for improving feed digestibility in cattle. Kaposi sarcoma (KS) refers to a type of cancer that develops from the cells lining blood vessels or lymph nodes. The cancer usually appears as tumors on mucosal surfaces or on the skin, but can also develop in body parts such as the digestive tract, or the lungs. The abnormal KS cells cause brown, purple, or red blotches on the skin, called lesions. No More Phone Tag provides proficient call answering services to all their clients in the greater Ohio region. The company works with health care institutions and property managers to help them retain their customers through customer care and support as well as prompt call answering services. No More Phone Tag utilizes innovative technology to deliver calls and messages accurately. They also have industry-trained call center agents who work round the clock to ensure that all calls are answered and dispatched on time. 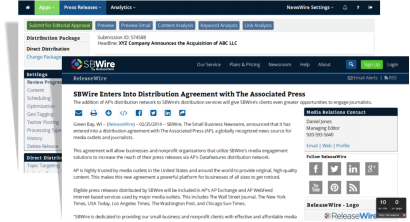 When you need more than just press release distribution, ReleaseWire is there to help. We offer a full suite of media engagement and outreach solutions such as ReleaseWire CRM.